The Centers for Disease Control (CDC) estimates drug overdose deaths based on a current flow of mortality data from the National Vital Statistics System has just reached a record of 71,568 Americans in 2017. That is a 6.6 percent jump in overdose deaths over 2016 and represents a rapid deterioration of America’s inner core: The middle class. More than 40,000 Americans died from opioid-related overdoses last year, and around 30,000 people died from overdoses of synthetic opioids, like fentanyl, said The Hill. The overdose deaths involving synthetic opioids increased sharply from 2016, while deaths from heroin, prescription opioids, and methadone dropped. Last month, in a separate CDC’s Mortality and Morbidity Weekly Report, we explained: The third wave of the opioid epidemic is here, as new synthetics [fentanyl analogs] that are 10,000 times as potent as morphine and used to tranquilize elephants are attributing to the latest surge in deaths. For context, drug overdoses killed more Americans last year (71,568) than the Vietnam War (58,220 U.S. military fatal casualties). Overdoses outpaced fatalities from suicide, or from influenza, and pneumonia, which claimed about 44,000 and 57,000 lives, respectively, in 2016. Drug overdoses almost rivaled the 79,500 people who die from diabetes each year in the U.S., which is the 7th leading cause of death. But there is no comparison to the 150,000 Americans that die each year from automobile crashes. The biggest spike in drug overdoses occurred in Nebraska, North Carolina, New Jersey, Indiana, and West Virginia (33.3 percent, 22.5 percent, 21.1 percent, 15.1 percent, and 11.2 percent increases, respectively). On a lighter note, the report mentioned areas like Wyoming, Utah, and Oklahoma experienced fewer deaths. Regions like Mississippi and, notably, Massachusetts, saw modest declines in overdoses, said the report. New England, the South, and the Rust Belt have been particularly hard-hit by the opioid epidemic, as their local economies continue to deteriorate. The Department of Health and Human Services recently declared the opioid outbreak a public health emergency. States are using grant money, which was signed into law in 2016, to counter the funding stress as the crisis continues to spread. Earlier this summer, House of Representatives passed a bipartisan bill in June aimed at curbing the out of control overdoses. Some Democrats voted for the legislation; others opposed it for not going far enough and for not containing guaranteed funding. 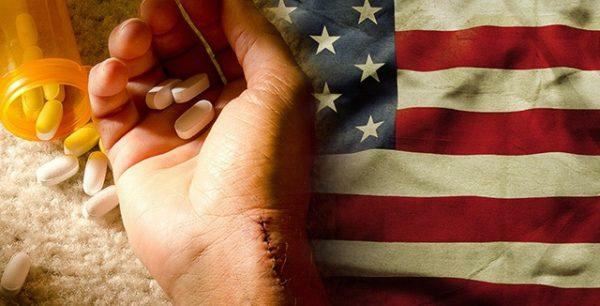 The drug epidemic is so concerning that opioid-related deaths have shifted the overall life expectancy rate for the U.S. lower for the second consecutive year. 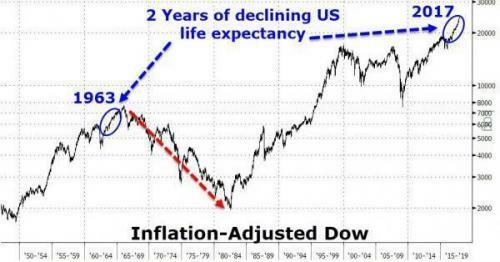 The last time this occurred, it was the early 1960s when the stock market raced to new highs, but then, shortly after that, experienced a sizeable market correction. America is in decline. Drug overdoses are at record levels. So…what now?